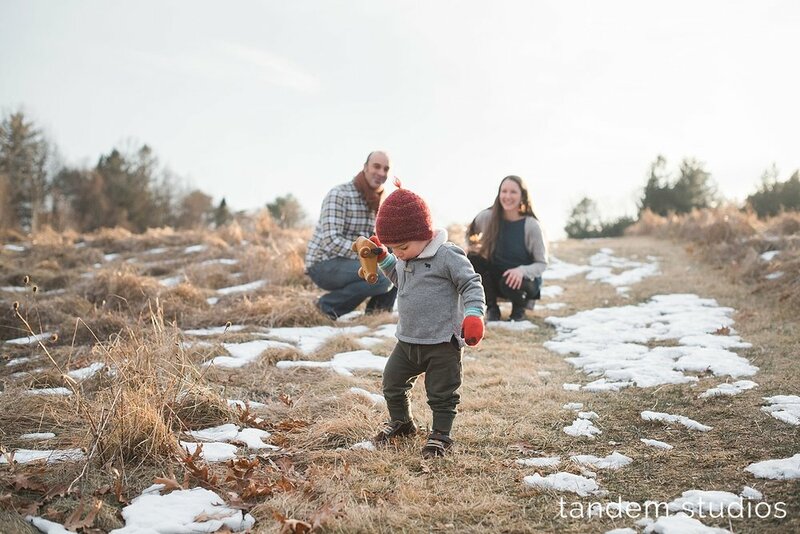 It may not look like an early February day, but we sure as heck lucked out with a "warm" winter day for our family session with these three! Mackworth Island is one of our favorite locations because of its versatility in all seasons. You can head down to the beach, walk the mile-long trail around the island and stop off in an open field or head into the woods. We just happened to do all of those things with Sarah, Greg, and their son, Dorian! Dorian was all into exploring the island with us and was just about the happiest kid around. There is such a depth of expression in this little guy's face! And of course, we had to get in some fun shots of just Sarah and Greg with Dorian close by and immensely occupied in his wooden toy car. In the midst of summer, I'm not going to say that I miss the days of winter, but there is something magical about the muted winter tones that we absolutely love!